Where on the political spectrum are you? Thread: Where on the political spectrum are you? I found this many years ago- and think it is as failed as any attempt to put any ideas into a neat little box. Yet it is very interesting, and you may learn something about yourself. Personally I tend to view things more as circles, or a sphere of circles, rather then this grid, or our normal right to left line. With those on the far right and far left often agreeing on many issues. Likewise the center intersects. Caveat- there is little information of who is behind this. According to the NYT and other sources it is the work of a political journalist and a very left leaning organization. So take it with a very large grain of salt. Re: Where on the political spectrum are you? and here's how you can post the image on WaccoBB. Last edited by Barry; 01-26-2017 at 02:23 PM. Let's see if I can pull this off- just took the text again. .. Thanks for posting your results, David! Who's next?? I'd be curious to see the results of some of our more frequent posters such as: arthunter, CSummer, Dixon, Edward Mendoza, geomancer, Glia, Peacetown Jonathan, photolite, podfish, rossmen, Sara S, sealwatcher, gypsey, Hotspring 44 , jbox, Jude Iam, Karl Frederick, kpage9, Larry Robinson, Magick, Moon, pbrinton, tommy and Zeno Swijtink. Care to play along? Don't be shy! Though it's a good survey there were some questions that seemed too complex for a simple yes or no answer ... It reminded me that when forced to take sides on complex issues we lose the middle ground and the chance to understand all points of view ... That being said, there were other questions that I felt strongly about and I didn't feel this way ... Just had to mention this ..
Last edited by Barry; 01-27-2017 at 02:52 PM. .. the site also offers you a chart, comparing you to other great thinkers. Barry, you're just a bit more libertarian than Bernie! I agree in general - it seems like this pretty much tallies the number of questions and moves you that many lines left/right/up/down. And it'd be more fun if the had a third dimension so you could fit in a sphere somewhere. But from my limited reading on the subject, it seems like these seemingly overly-extreme questions, with no room for nuance, somehow do generate plausible data. I mean, how do you rank your agreement from 1-10 on some topics? do you use a linear or exponential scale? do you grade on a curve? It's probably fundamentally a flawed idea - people whose spots overlap are probably not identical, even politically. But it's got entertainment and illustrative value. Hey, who here's gonna be the first to break out of our south-west (lower-left) ghetto, anyway??? Last edited by Barry; 01-27-2017 at 02:53 PM. ....And it'd be more fun if the had a third dimension so you could fit in a sphere somewhere. This is false framing and dishonest mislabeling. 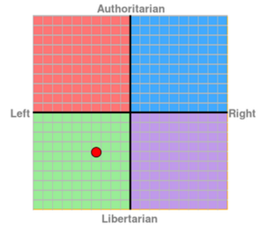 It's not a "Libertarian" and "Authoritarian” axis. That labeling comes from a biased Libertarian position. It is “Libertarian” and “Communitarian”. Last edited by Barry; 01-28-2017 at 08:48 AM. Maybe because it's my first post? I have refreshed, logged in, changed password, updated profile, and still get the error. Who's next?? Care to play along? Don't be shy! Last edited by Barry; 01-29-2017 at 01:40 PM. as said in the sonomaPatient's post - two axes aren't enough. Libertarian may not be the opposite of authoritarian, but neither is communitarian. You have a reasonable observation that communitarian values often oppose libertarian ones - is that the best way to judge opposites? I don't know.. Authoritarians don't respect the rights of the individual (though they may claim that's their highest value - as long as you agree with their choice of important rights) but they don't necessarily value the welfare of the community either. In fact, it's kind of hard to think of an authoritarian regime that did! fun for a parlor game. bernie didn't support the best healthcare plan as it was too progressive/gutsy for him, just as he will never support "sensible gun control", nor did he have a plan that was workable for paying for college (& i love reich & was ashamed he joined bernie on the "funding scam....5+% growth". (though the real revolution is in promoting jobs in the trades, programs in junior high (& high school) that have been successful in putting disenfranchised youth in tech jobs. rhetoric is cheap. i have been "feeling the burn". leveling the playing field economically is a very good thing. banning trade agreements is small minded & protectionist. hillary is boring because she talked about complex issues. (she was the only candidate i heard who discussed these successful alternatives for college). college is important for jobs that require degrees. we have been leveling the playing field for the world through trade. (though it needs monitoring for working conditions and environmental concerns). slogans, with out plans are just that...(hot air that stirred many, but took us know where). Last edited by Barry; 03-08-2019 at 10:35 AM. So far, arthunter and I are the closest in political viewpoint. We're not in lockstep, but relatively close. Imagery's post above made me think. This may tell us something about where our beliefs are- but it doesn't say anything about how we walk those beliefs in the world. Looking at my results- you'd think I was a "Bernie Bro" . But I wasn't. I disagreed with him on a number of issues. And felt he was too removed from the real world. Also realizing my views are often far left of the majority of americans. I guess what I am trying to say is that there can be a very substantial difference between your political beliefs, and how you let them play out in the real world. Or not. Certainly we have plenty of evidence of those who persue their "beliefs" at whatever cost. As well as those that temper their beliefs and are content to try and nudge things in a direction. And plenty inbetween...most if not all of us have issues we won't compromise on. It might be interesting if people who took this test alos posted who they voted for in the primaries and general election. I voted for Gary Johnson- not because I thought he was the best, or even a good candidate... but because the "D" vote doesn't matter much in this state- and I'll do anything I can to get 3rd parties to the threshold to get federal funding and start breaking up our sad 2 party system. And, because, I really couldn't vote for either Hillary or Bernie ( had I been somewhere where my vote may have mattered... I probably would have voted for Hillary). words words ,,do something every day ,as best U can to improve this world we live in starting with you. Perusing the archives of Waccobb, I stumbled upon this discussion, dating back a couple of years. I thought I'd revive it and put in my two cents. Some years ago, back in the 1990's, I conceived of another way to map the political spectrum. I call it the "pretzel" or "mobius-continuum" model. It has the advantage over the conventional 'left-right' paradigm - or the Libertarian square model depicted above - of reserving a seat, (or station,) for the power elite. It also shows that if one goes far enough to the 'left' one can come out on the 'right.' - Or, visa versa. Through the Looking-glass. This has happened several times in history. It has happened with whole political groups. Mussolini, for instance, led the 'left-wing' of the Socialist party in Italy into the Fascist position, and Lyndon LaRouche led his faction of the S.D.S., the 'Labor Committees,' to the left of the Maoist Progressive Labor Party, before they arrived at a position which to this day straddles the extremes of left and right. Indeed, the common, simplistic, misconceptions about the political spectrum can not describe or map such a migration. I think it is most important to realize that the so-called "political spectrum" in America is a contrived phenomenon, designed to foster division, chaos, and alienation of grassroots peoples. Divide and rule. Thanks for digging deep and reviving this interesting and fun thread, Mark! I agree that the far left and the far right can converge, as mentioned David's original post included below. 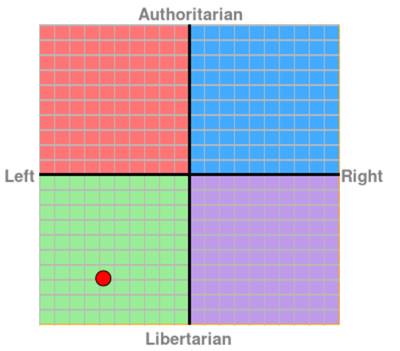 For reference, I've included that post below with the link to the online test about your political views that generates a graph for where you fall on 2 axes (left/right and authoritarian/libertarian). See my graph at the right. I welcome any further comments about this test, including posting your graph, and other modeling systems, such as Mark's "mobius-continuum" model. See that oval in the middle? That's where we are pouring our money. The 'Bond-holding Class' are the latter-day Gentry, whose class interests are served by the members of that very exclusive Men's Club who have offices under the pyramid atop the Bankers' Trust Building at 14-16 Wall Street. Here is a link to my old article about the systemic mechanism of this process. One thing I find interesting in my own life is just how much I have in common with people of seemingly very different sociopolitical perspectives, especially when we talk with genuine interest in each other's views. I find it regrettable how people are divided into camps and encouraged by the media and many public figures to believe they are divided in dramatic ways. This isn't to say that I don't sometimes find profound disagreement with others, but I also usually find profound agreement with those same people. This test was interesting, though it's hard to know how scientific it is. The website does seem to show an interest in defining what they are analyzing in the test and some of it's limitations (such as only being appropriate for so-called Western democracies). I did find myself occasionally thinking about questions not just from my perspective in my own culture and country, but also from understanding how my answer might be very different if I were in a different country, even if the same question was relevant. For example, the values in re. to the essential purpose of education have a lot to do with the economic privilege of a society as a whole, for sure, and likely even to specific communities, and so that question may not be a reliable social values-spectrum indicator. But overall, I would estimate that most questions do seem to make sense in the target context of Western democracies. Their main page and FAQ discuss the terminology they use and how it is intended to be interpreted, along with some examples of different usages of the terms. It's worth reading that before taking the test. Even people that fundamentally disagree on these measures (say, are at opposite corners of opposite quadrants) still have the human condition in common, and are motivated by the same fundamental nature. With a wider perspective, they can recognize that what they disagree on are details, and not likely fundamental to their nature or even their interests. Even though those details may be very important, the grounds for conversation are common, and it can be possible to respect and even understand others we disagree with even when we believe some of their their views are so much as very dangerous. I always remember what Daniel Bell had to say about his own orientation(s.) He said that he was "in politics, a liberal; in economics, a socialist; and culturally, a conservative." I like that. And there you have it: That's three distinct categories accounted for, and there are certainly more categories than merely three. Last edited by Barry; 03-15-2019 at 09:56 AM. Having started thi thread... I'd say since then I've become far more interested in not where on the political spectrum you are... but how entrenched are you? How set are you that your view is *right* and everyone else is wrong? A major problem I, and many others see in our nation at this time. It's not that simple, though. People's moral stances are usually pretty firm, and probably that's for the best. That means that "your truth" (a phrase I hate..) is what it is, and probably won't change. The major problem might be that people aren't willing to make room for people with other priorities. Every once in a while you see someone writing a piece about how shockingly enough most people agree about a lot of things, as if that's surprising. Actually, most people's disagreements are on how you rank your priorities and how much you'll concede on one goal to achieve another. The problem isn't that one side has to be right, it's that we can't really even have the discussion. People have been pitted against each other explicitly by Trump et. al., but also by the media's built-in tendency to cover things as binary. Primary voters buy into it and won't actually reward compromise. It's not the people's willingness to change their positions that needs to increase, it's their willingness to negotiate with those who have different goals. Last edited by Barry; 03-24-2019 at 10:31 AM. podfish said: Actually, most people's disagreements are on how you rank your priorities and how much you'll concede on one goal to achieve another. The problem isn't that one side has to be right, it's that we can't really even have the discussion. People have been pitted against each other explicitly by Trump et. al., but also by the media's built-in tendency to cover things as binary. Primary voters buy into it and won't actually reward compromise. It's not the people's willingness to change their positions that needs to increase, it's their willingness to negotiate with those who have different goals. That's just right podfish. Well put. I was about to write a response, but here, you beat me to the punch. I couldn't agree more. The thing about Trump now: He's divisive, yes, but isn't it the same old binary game that they always play with us?" It's Us against Them. And more and more people are seriously wondering if the power elite themselves are trying to initiate a new Civil War. That is, have the peons kill each other off over the phony "left vs. right" divide. I consider myself an old-school 'socialist.' But I am aware of the history of the Republican Party in former times, and know that it once had a 'left wing.' That faction of the old Republican Party, known as the "Western Progressives" was 'bell, booked & candled'(i.e., excommunicated) in 1917, during World War One. Just to the 'left' of the old left-wing Republicans of the nineteenth century, you had the "Populist" or "People's Party." Both of these factions looked to the "Greenback Dollar" and the "Free Coinage of Silver" as the economic salvation of America. Now, what was that all about? The "Greenback Dollars" were issued, four hundred and forty million dollars of them, during the (first) Civil War, to take care of business and finance the War. There was no silver or gold backing it. There was no Treasury Bill behind it [the Federal Reserve Note is backed by T-Bills]. It was pure, Fiat Money, backed by nothing but the collective 'faith' of the Nation. Now, back in the nineteenth century, and on through the 1930's, this Issue - and all of the ramifications thereof - was understood minutely by the humblest farmer on the Prairie. It was Lincoln also, the ideological 'father' of the Greenback Dollar, who spoke so eloquently at Gettysburg of "Government of the People, for the People, and by the People..." To the Radicals of the nineteenth century those words were a beacon of hope, and, on to the Farmer-Laborites of the 1930's, those words of Lincoln resonated as a clarion for "economic democracy" - which is the equivalent of 'democratic socialism.' Ha ! Would that 'both sides' of the current, artificial divide only realize how much they actually have in common. Yet the power elite would have the Plebes kill each other off in a civil war, and will, when the bullets fly thickest, fly down to Paraguay, or else descend into their bunkers under the Blue Ridge Mountains of Virginia. It isn't right. « (Previous Thread) Any local progressives feel moo-ved to carpool to a Devin Nunes speech in Fresno?